Nordon Paintwackers paint stirrers or Liquid mixers are available at prominent paint suppliers, or contact Nordon for a list of stockists. Strong, welded steel frames on all products, ideal for the Professional Painter and Home Handy-person. "Paintwacker®" paint stirrers are available in 3 sizes for use in small to large cans. The curve on the bottom of the Paintwacker® paint stirrer fits right to the edge of the paint can. Paintwacker® paint stirrers don't entrap air, but still breaks up settled material. The No 8 and No10 Paintwacker® paint stirrers can accommodate most extension poles for mixing made easy. Contact Nordon for a list of stockists near you. The Juggernaut® paint roller frames are robust paint rollers ideal for the Professional Painter and Home Handy person. The robust steel construction paint roller frame produces uniform application of paint. Does not mark the painting surface as some aluminium rollers do. Does not jam after use. 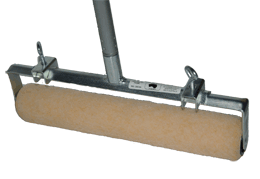 The paint roller frames are fitted with a screwed socket for adapting to most extension poles. Adjustable ( 270mm up to 460mm).